Enescu is known more by reputation than by actual concert performances. I virtually never see his works programmed. The booklet notes for this CD suggest that this neglect might be due to the difficulty in categorising this composer. During his visits to the USA, his reputation was as a conductor whilst in Europe he was known more as a violin virtuoso although he considered himself a conductor first and foremost. From my experience the Enescu works most likely to be encountered are his Romanian Rhapsodies Nos. 1 and 2 and in recital I have heard the String Octet a couple of times and also one of the two String Quartets over a decade ago and possibly also the Piano Quintet. The Berliner Philharmoniker is an orchestra renowned for its wide repertoire and using its extensive and magnificent archive of the Digital Concert Hall as an example currently the only Enescu work available is the Romanian Rhapsody No. 1 recorded in 2007 by Sir Simon Rattle at the Waldbühne, Berlin. Twentieth-century music by Henze, Ligeti, Zimmermann, Kurtág, Shchedrin and Rihm has all been performed far more often than Enescu. In the case of Berio twelve times and Lutosławski eleven times compared to Enesco’s single outing. Patently Enescu’s music is unfashionable and it will require one or two of the leading symphony orchestras to champion his music to set the ball rolling. Often Enescu would sketch out compositions and move onwards to another rather than complete them. One such work from 1923 is the previously unknown Isis - a symphonic poem for female choir and orchestra. Pascal Bentoiu the composer and musicologist discovered sketches for Isis in a Budapest archive. It seems that Isis, the mythical name of the beautiful Egyptian goddess of magic, was the pet name that Enescu gave to his mistress the Princess Maruca Cantacuzino whom he later married. Bentoiu undertook the challenging project and made a performing version of Isis in 1999. With so many beautiful tone colours a highly atmospheric often aqueous quality imbues the writing. Without wishing to make a direct comparison at times I was reminded of aspects of the character of Debussy’s music especially Prélude à l'après-midi d'un faune and La mer. There are suggestions of Szymanowski too. The central third of the score, around 8:56-12:35, contains seven short episodes of ethereal, wordless singing from the female chorus of the NDR Chor from Hamburg. Bentoiu has done a remarkable job of transforming Enescu’s sketches into a performable score. Another incomplete work is the Symphony No. 5 in D major for tenor, female choir and orchestra. This the composer sketched out in 1941 leaving only two-thirds of the opening movement written out in full. Once again it was Pascal Bentoiu who made a performing version of the symphony in 1995/96. Reminding me of the impressionism of Szymanowski, Debussy and Ravel, the opening Moderato molto is marked by its delightfully flowing, ecstatic and sensuous textures. A beautiful movement, the rather weighty Andantino, contains a variety of richly woven and colourful tone colours reminding me slightly of the music of Arnold Bax. Relatively exiguous at just over four minutes the bustling Scherzo has a sweeping momentum. A sense of melancholy imbues the earnest Finale but nevertheless it remains appealing. At 5:45 Michail Eminescu’s movingly reflective text De-oi adormi curând (I have one last wish) is compellingly sung by Romanian tenor Marius Vlad. In this he is satisfyingly accompanied without words by the female singers of the NDR Chor. With a baritonal quality Vlad’s voice is in fine condition, clear and well projected. As with Isis Bentoiu has prepared an outstanding elaboration of Enescu’s sketches into a performable work which achieves a gentle and effective conclusion. I’m reasonably familiar with German orchestras but the Deutsche Radio Philharmonie Saarbrücken Kaiserslautern is new to me. It was formed in 2007 following the merger of the Rundfunk-Sinfonieorchester Saarbrücken of Saarländischer Rundfunk (SR) and the Rundfunkorchester Kaiserslautern of Südwestrundfunk (SWR). London-born Karel Mark Chichon is its principal conductor. He has held that post since 2011. Holding the baton for this CPO release is German conductor/composer Peter Ruzicka. His name may be familiar from his having conducted a number of excellent recordings of the music of Hans Werner Henze on Wergo. 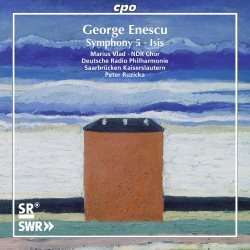 In these two Enescu scores the orchestra is consistently splendid in creating memorably atmospheric performances resplendent in autumnal colours and warm sensitivity. I like the way Ruzicka never tries to overstate the character of these gratifying works leaving a sense of natural unforced music-making. As I have come to expect from CPO the booklet essays and annotation are first class providing copious amounts of information. The text of Eminescu’s poem is provided in full complete with German and English translations. As for the recording it is hard to fault the engineers for such admirably clear and well-balanced sonics.